So, you’re in the market for some new pots and pans. Before you stick with nonstick or buy something new and funky (silicone maybe? ), let’s talk about the pros and cons of all cookware materials. 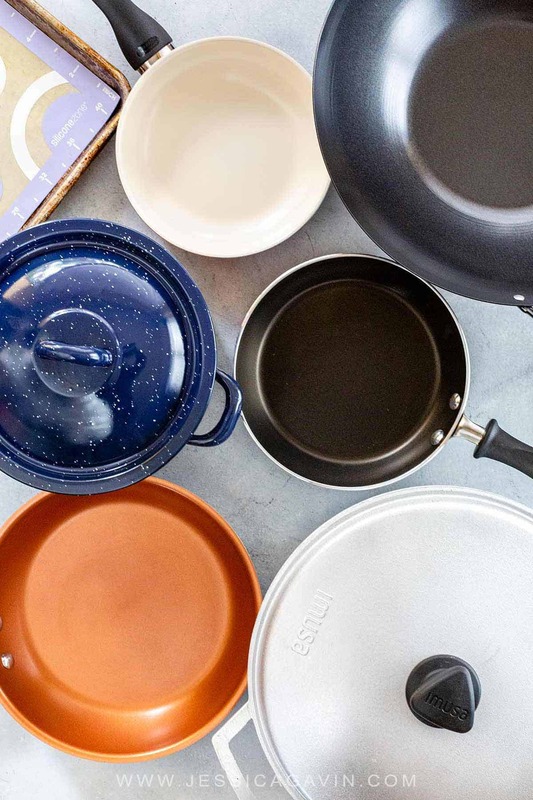 You have so many options when it comes to cookware, it can actually be a little overwhelming. Which material is the best? Which lasts longer? Which is most versatile? They all have their pros and cons, so it’s just about choosing what’s best for your cooking style. Hopefully, this quick guide on what makes each material great and what their drawbacks are will help. Virtually indestructible, cast iron is an old fashioned cooking material that’s porous and delivers a lot of flavors when taken care of properly. Pros: It’s both affordable and durable. It’s also versatile and can handle high heat, able to go from the stovetop to the oven. It’s known for retaining heat well, which lends itself to cooking foods more evenly. Cons: It requires a little extra TLC to clean and maintain than some other cooking materials. It’s not ideal for cooking acidic foods, as it can strip the seasoning. It can also rust if it’s not maintained properly. Enameled cast iron has a porcelain coating that prevents rust and makes for easier cleaning. It can also transition from stovetop to oven. Pros: It has the cooking benefits of cast iron but cleans up easier and doesn’t require seasoning. It’s better for cooking acidic foods, as you don’t have to worry about stripping the seasoning or food reacting with the material. Cons: It’s pricey. Its nonstick quality isn’t always as strong as that of a well-seasoned regular cast iron pan. It’s also pretty heavy which can make storing it tricky. Stainless steel is a popular material for cookware, but it’s not all created equal and the higher-end lines deliver better results. Pros: It’s nonreactive so it won’t affect the taste of your food when cooking with acidic or alkaline ingredients. It heats up quickly. It’s also dishwasher safe — and oven safe as long as the handles are all stainless steel. Cons: It doesn’t distribute heat as well as some other materials. Though some higher-end lines add an aluminum or copper core to fix this. It’s also tougher to clean, as burnt on foods can really latch on unless you purchase a higher grade of steel. Carbon steel pans are made of mostly iron and some carbon. It’s durable like cast iron but much thinner. Pros: Like cast iron, it retains heat well which cooks food evenly and makes it ideal for searing. It delivers that rich, grilled flavor. However, it’s more lightweight than cast iron. As long as it’s seasoned properly, it remains naturally nonstick. Cons: It requires seasoning to maintain and cleaning isn’t the easiest. It’s not dishwasher safe and you shouldn’t cook with acidic foods when using carbon steel pans. While copper can look like a novelty item, it’s not ideal for everyday cooking. Pros: It’s has great heat retention properties and cooks food evenly. That’s why some manufacturers add it to the core of stainless steel pans, which are otherwise lacking in that category. Cons: It doesn’t come cheap. It also requires polishing with lemon or vinegar and salt to keep it in good condition. Similar to cast iron, it’s reactive with acidic and alkaline foods which means those foods can take on the taste of metal and actually absorb small amounts of copper. There are two types of aluminum you’ll find on shelves: regular aluminum and anodized aluminum. Each has its own pros and cons. Pros: Regular aluminum is lightweight and affordable. It also retains heat well. Anodized aluminum is a bit sturdier, more durable, and more scratch-resistant compared to regular aluminum. Cons: Regular aluminum has the same downfall that copper does; it reacts with certain foods, which is what makes anodized aluminum the more ideal cooking material. However, anodized aluminum is more expensive. It’s a go-to cooking material, but it’s had its share of controversy over the years. Yet, there are still advantages to cooking with nonstick pans and pots as long as you keep a few rules in mind. Pros: The most obvious benefit is in the name: they’re nonstick. The material is easy to clean and requires less oil when cooking because of the smooth coating. Cons: Once the coating chips, the high heat is believed to expose food to toxic chemicals often used in nonstick cookware (PFOA and PTFE, referred to as Teflon). Whenever possible, buy nonstick pans that don’t use these harmful compounds. However, they’re usually more expensive. The rule “you get what you pay for” especially applies to nonstick pans. Avoid heating without oil and don’t use too high of heat and you’ll get more out of this cooking material. It’s typically reserved for casserole dishes. But you don’t come across many people cooking with glass pots and pans. They aren’t as widely produced, but they are available. Pros: The biggest pro is that you can see the food as it cooks, keeping a closer eye on progress. They also double nicely as serving dishes, so you don’t have to change dishes before serving. Cons: It’s not-so-nonstick, and your food is more prone to burning. Compared to other materials, its heat distribution isn’t great. While it’s often referred to as ceramic nonstick cookware, it’s actually often aluminum with silicone finish that has a ceramic-like texture. Pros: It’s nonstick, though not as nonstick as regular nonstick pans. It’s free of chemicals like PTFE and PFOA that tend to scare people away from traditional nonstick pans. And it’s thought to be more environmentally friendly. Cons: The nonstick quality can fade over time. It’s not dishwasher safe, as it can strip the nonstick coating. This cookware has become more popular with scares over Teflon in nonstick pans, and it’s made from bonded silicon and oxygen. Pros: It’s stain-resistant, easy to clean, and nonstick. Those are the key benefits. Cons: Because it’s newer to the market, there’s limited research on how safe it is. Initial studies say it’s safe, but no follow-up studies have been done.